The Meeker Inn shown here about 1910 stood at the North West corner of Morris Ave and Stuyvesant Ave. Established by John Meeker about 1756. It was noted for its fine ales and visits by George Washington during the American Revolution. 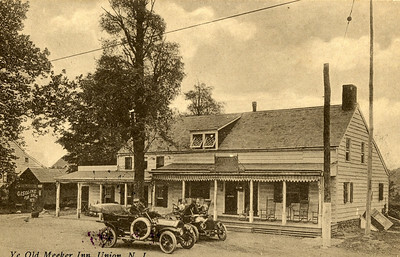 August 20, 1895 - New York Tribune Obituaries: John Meeker, for many years proprietor of Ye Olde Meeker Inn, one of the most noted hotels in Union County, NJ died yesterday at the Elizabeth Hospital, sixty three years old. He was born at the inn, which his father, grandfather and great grandfather kept before him. The place has been kept by the Meekers nearly one hundred and fifty years. John was the last male member of the family and leaves two daughters. 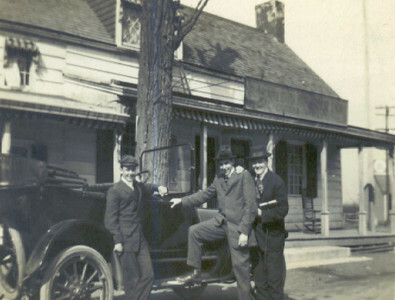 The inn was referred to as O'Reilly's in the early 1900's. O'Reilly's was used to symbolize the temptation of Arthur Lang, an alcoholic rehabilitating at the Self Master Colony down the street as noted in a pamphlet published by the colony. It was torn down in November 1929 to make room for the Union Center National Bank which stands there today. 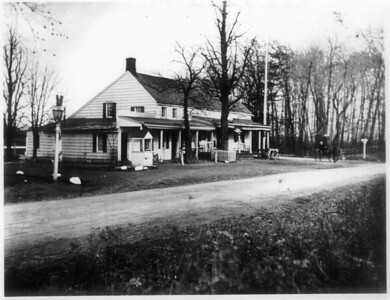 The Meeker Inn around 1890. Established by John Meeker about 1756. It was noted for its fine ales and visits by George Washington during the American Revolution. 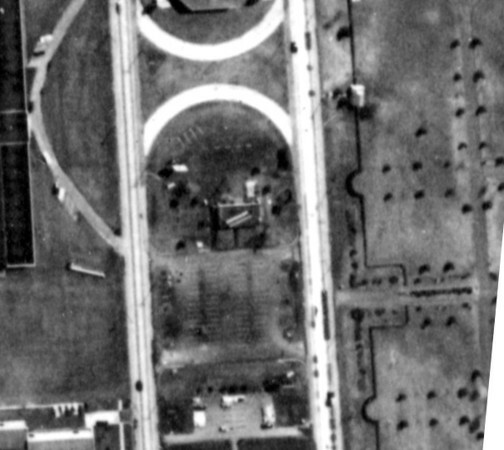 It was torn down in November 1929 to make room for the Union Center National Bank. 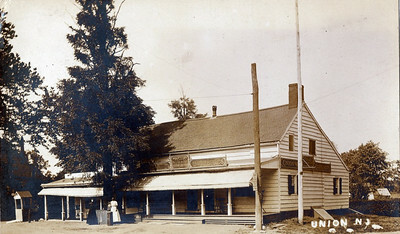 The inn was referred to as O'Reilly's in the early 1900's. O'Reilly's was used to symbolize the temptation of Arthur Lang, an alcoholic rehabilitating at the Self Master Colony down the street as noted in a pamphlet published by the colony. 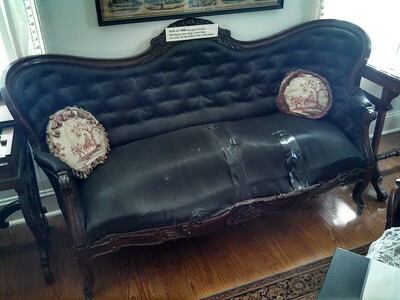 This couch from the Meeker Inn can be seen at the Caldwell Parsonage Museum. Bonnel and friends in front of the Meeker Inn. 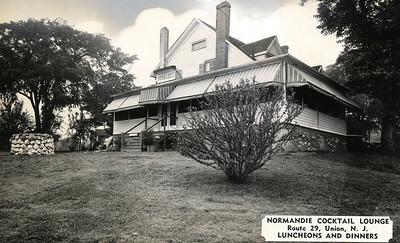 located on Morris Ave. in Stuyvesant Ave about 1910. 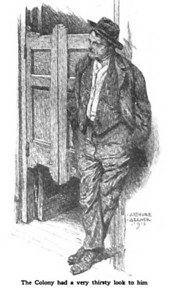 A drawing of Arthur Lang in front of Riley's, formerly The Meeker Inn. Mr. Lang claimed to have been drunk for 10 years before he went to the Self Master Colony to get help. 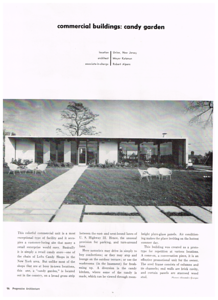 An article appeared in the American Magazine about Arthur Lang and The Self Master Colony in 1914. 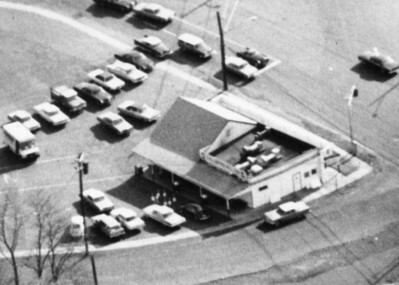 19th Hole tavern / restaurant which was located at the current location of Burger King on Route 22 East. 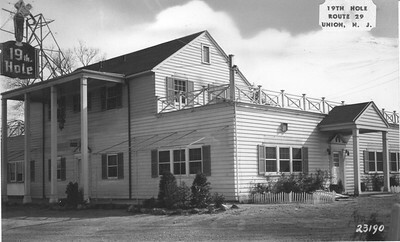 This building was originally a farm house purchased by the Nealon Family in 1856 who ran a farm on the site of the drive in. 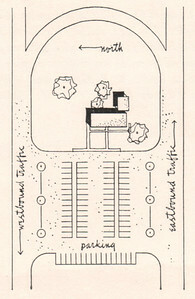 In the 60's the establishment was The Hitching Post and was a reputed "mob joint". 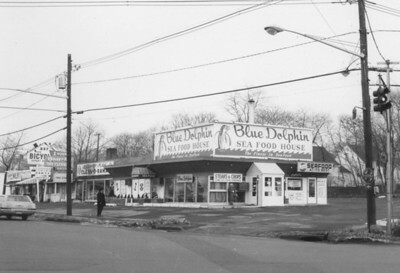 The building burned down in the late 60's. 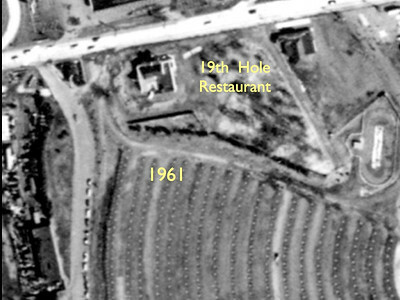 Aerial photo of The 19th Hole Restaurant which was on Route 22 east in front of the Union Drive in. Burger King currently resides on the property. 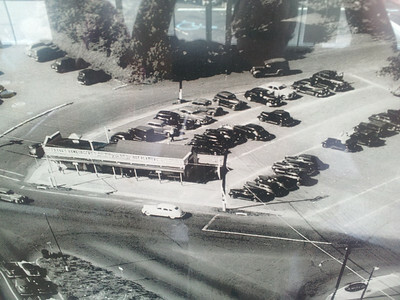 Petersen's in the 40's now The Galloping Hill Inn located at Five Points. 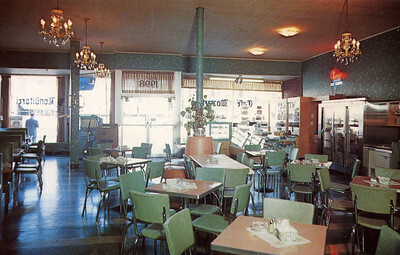 Petersen's in the 60's now The Galloping Hill Inn located at Five Points. 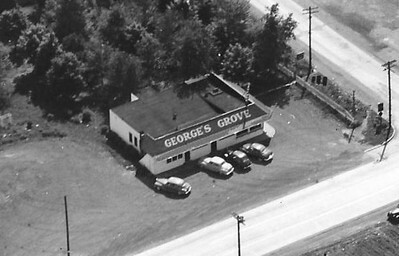 George's Grove- Technically within the 672 foot stretch of the South side of Route 22 that is Kenilworth at the South-east corner of Michigan Ave and Route 22. 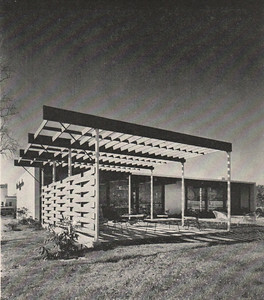 Photo taken in 1949. 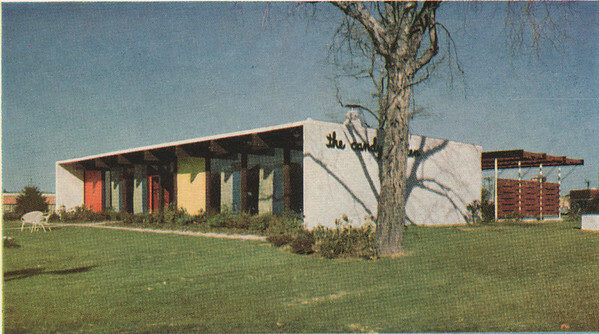 The Normandie Cocktail Lounge was located on Route 29 (now Route 22 west bound) at Fairway Drive N. with it's back on West Chestnut st. The building was torn down to make way for the Mini U storage facility. Click "Map This" to map the location. 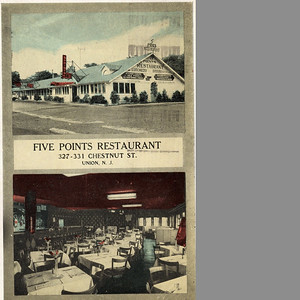 A 1951 post card for Five Points Restaurant which was located on Chestnut St. at Five Points where Rite Aid is currently located. 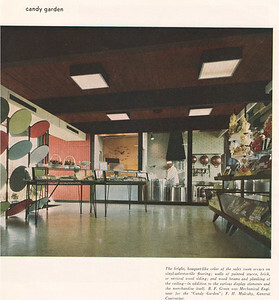 Postcard for Cafe Mozart- current site of "Mood" in Union Center. 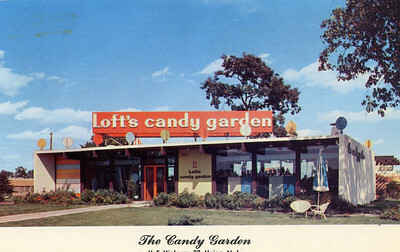 1961 Aerial view of Loft's Candy Garden that was located on the middle island of Route 22 where Wendy's is currently located.